Linda here to share a calendar I made using products I have used can be found on the Imagination Crafts website. I am so pleased how the photograph has picked up the glitter and sparkle. I hope that you all had a wonderful Christmas and Santa was good to you all. 2. Brayered Diamond Sparkle over the plaque. 3. Onto the Acetate I have stencilled with a mixture of Gold, Purple and Turquoise Sparkle Medium using the Wild Flowers Mask. 4. I used my Cropadile to punch 2 holes and added gold and cream cord. 5. Added lace to the bottom of the calendar and then adhered this to the acetate which I have wrapped around and adhered to the back. I then covered the back with patterned card. Hope you've all had a wonderful Christmas with your friends and families. I would just like to take this opportunity to wish you all a Happy New Year when it arrives. Time to party lol !! Well enough chit chat, I could talk the hind legs off a donkey lol !! so my hubby tells me. On to today's card, one I made for Imagination Craft's in November 2012 for the QVC show in January 2013. 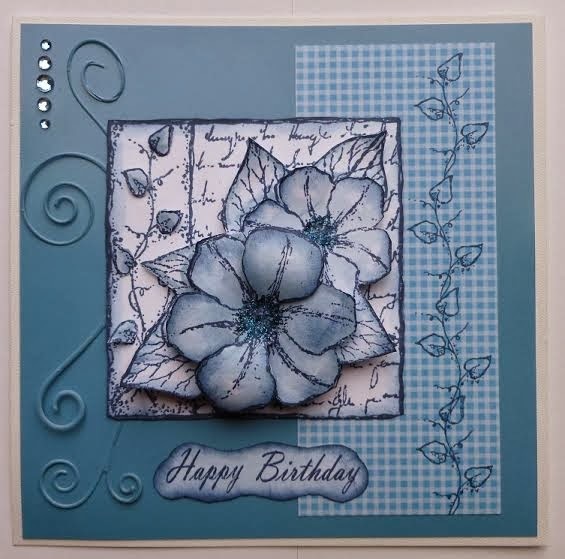 For this card I used another very pretty decoupage stamp, the Clematis. Make a base card from white card stock. Take a square of blue shiny card, cut slightly smaller than the white and matt this onto the white base card . Cut a piece of blue gingham paper approx. two and a quarter by five and a quarter inches and fix to the right-hand side of the base card. Using the Chipped Sapphire Distress Ink Pad, stamp a row of leaf stems down the right edge of the gingham paper with the leaf stamp from the set. 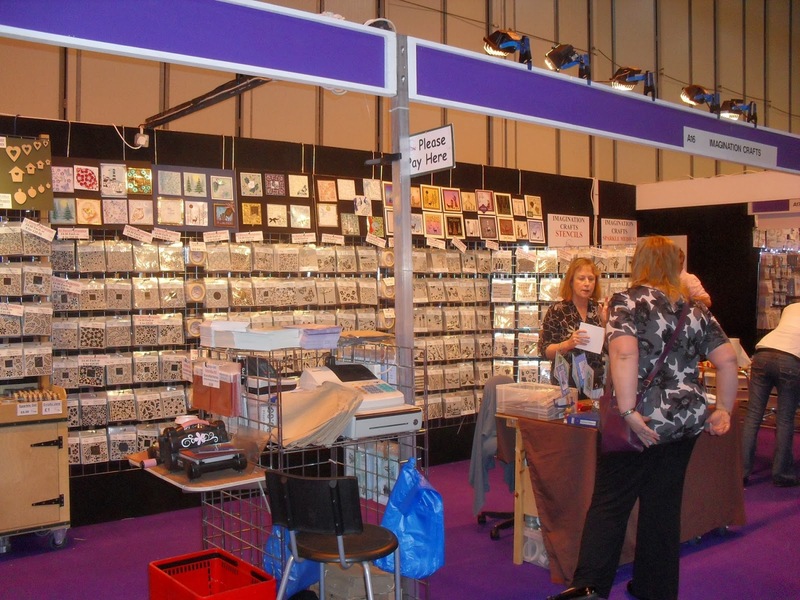 Stamp the main image onto white card using the same blue ink pad. stamp this a further four times. Colour using Promarker Pens and distress inks. Cut out and 3D onto the main image using silicone glue. Using a die-cutting machine, some of the blue shiny card and the flourish die, cut out and emboss the flourish. Glue this to the left-hand side of the base card, then glue the 3D image to the centre of the card. Stamp out 'Happy Birthday' onto some white card using the blue distress ink pad. Cut out and colour with distress inks. Glue this to the centre bottom of the base card. Lastly add five light blue gemstones to the top left of the card. That's all for now folks, keep well, warm and have a fabulous New Year. Hope everyone is fit and well and have all of your Christmas preparations done or nearly done. I still have a few finishing touches to do before the big day. The card I have for you today was made in June of last year for Sue and Harvey of Imagination Crafts and uses their Christmas Lantern Decoupage Stamp Set as the main image. Ok let's get down to the making of this card, shall we? not much time left to get them in the post now! Make a base card from some dark green card stock. Take a piece of red card cut slightly smaller than the green. Lay the holly stencil on top and spread the red sparkle medium across the bottom left corner only. If you don't feel you can do this accurately, just mask off the top right corner of the stencil with some copy paper. Remove stencil and leave to dry. When dry score straight lines across the top right corner using the score board and crease mouse. Using the Dovecraft corner holly punch, punch out the top right corner. Using a die cutting machine, cut out and emboss the Mariane branch die, one in dark green and another in a lighter green card. Fix the red card onto the dark green card. Take some white card and using the Versamark Pad, stamp the main image onto it and heat emboss using black embossing powder. Next using the Silkies with a little water and a piece of cut n' dry foam, spread the colours over the image leaving a small amount of white showing on the candle. Cut out the image and matt onto some red card leaving a border showing. Matt this onto some dark green card and trim to leave a small border of green. 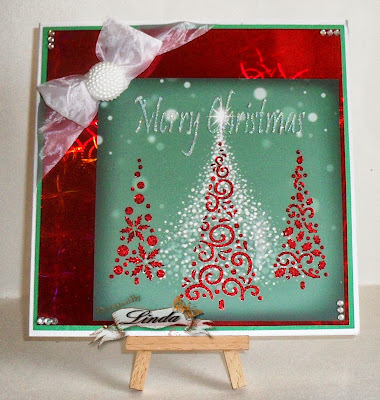 Glue the Christmas tree branches diagonally across the red card and fix the stamped image on top. Add a red ribbon bow and there we have it, another finished Christmas card. Thank you so much for dropping by our blog, hope it has given you some inspiration for your Christmas cards. Until the next time, stay happy, healthy and have fun ! It's time for another post, these days are just flying by, it will be Christmas Eve in the blink of an eye. I do hope you are all prepared, cake iced, cards written, decorations up and presents wrapped. I have to admit, I'm not ready lols late with preparations this year. I'm usually all done by now!! ah! well, I'll get caught up soon. Must sit down and write my cards tomorrow !! instead of crafting lols. Today's card was made for Sue and Harvey of Imagination Crafts in July 2012 in time for all the craft shows leading up to Christmas. Make a base card from black shiny card. 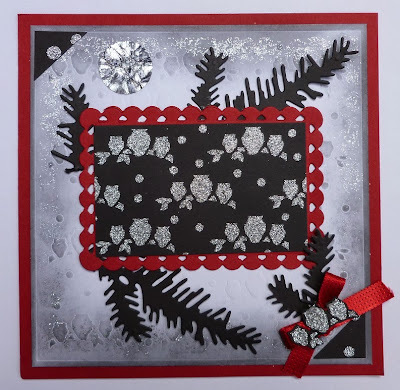 Take a piece of white card slightly smaller than the black and stamp the holly stamp from the set, around the edges using a black ink pad. Matt this onto the black shiny card. Take a piece of shiny gold card and lay the embossable onto it and put through an embossing machine and emboss it. Put the embossable back onto the embossed gold card and spread the sparkle medium over it using the spatula and then remove the embossable and leave to dry. Wrap three strips of black ribbon diagonally across the top left half of the gold card and secure on the reverse at the top only. Stamp the main image nine times onto white card, the first image is used as the base. Colour with Promarker pens, cut out and 3D using silicone glue. Fix three pieces of gold ribbon to the right of the holly tree on the base image. Cut slits on the gold ribbon on the right of the image and thread the black ribbon down through the slits and secure on the back of the card. Matt this onto some black shiny card then onto some white card, leaving a tiny border showing each time. Fix this to the gold embossed card , lining up the black ribbons with the ribbons on the gold embossed card. Matt this onto the base card. Using an oblong die, cut out and emboss an oblong from white card. Stamp 'Glad Tidings' onto it with black ink. Punch out some small circles from gold card and glue to the right-hand side of the label. Punch out some small gold stars and glue to the left-hand side of the label. Matt the white label onto some black card and fix to the right-hand side of the base card near to the bottom edge. Punch out and glue some small black hearts to the top and bottom of the label. Fix a black gem stone to each corner of the card. Well that's it guys, we're finished. This is not a quick card to make but could be for a special friend when you don't mind spending that bit extra time making it. Thank you so much for stopping by our blog and I hope my card may have inspired you in some small way. Until the next post, take care of yourselves. Hi there All, Jennifer back again with another card. I thought I would steer away from Christmas cards on this post and concentrate on what the Spring and Summer will hopefully bring next year, something I think most of us like, butterflies. 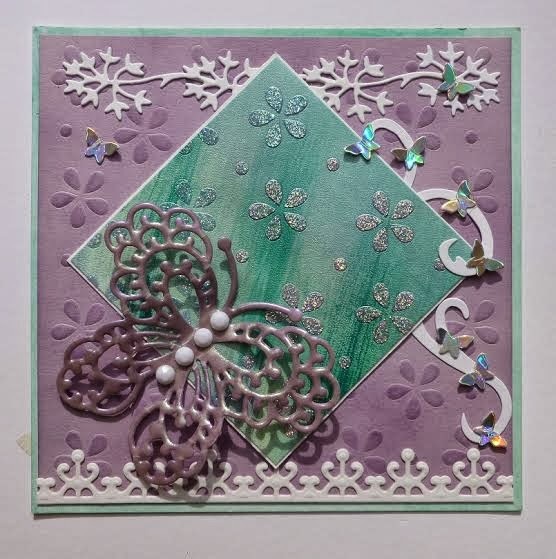 This card I made in September 2012 for Sue and Harvey of Imagination Crafts and uses their Daisy Dots Embossable and of course uses their beautiful Sparkle Medium, which I love. It really is so....easy to use and you end up with a very professional finish very quickly. You do have to wait a little while for it to dry, but then you can get on with the rest of the card. The beautiful effect is well worth waiting for. Make a base card from light green card. Take a piece of lilac card slightly smaller than the green card and emboss in an embossing machine using the Daisy Dots Embossable. Gently rub Dusty Concord Distress Ink over the lilac card and fix this to the base card. Cut out and emboss four flower dies (Marianne Design) from white card and glue along the top of the base card. Cut out and emboss the scroll (Tim Holtz) from white card and glue down the right edge of the base card. 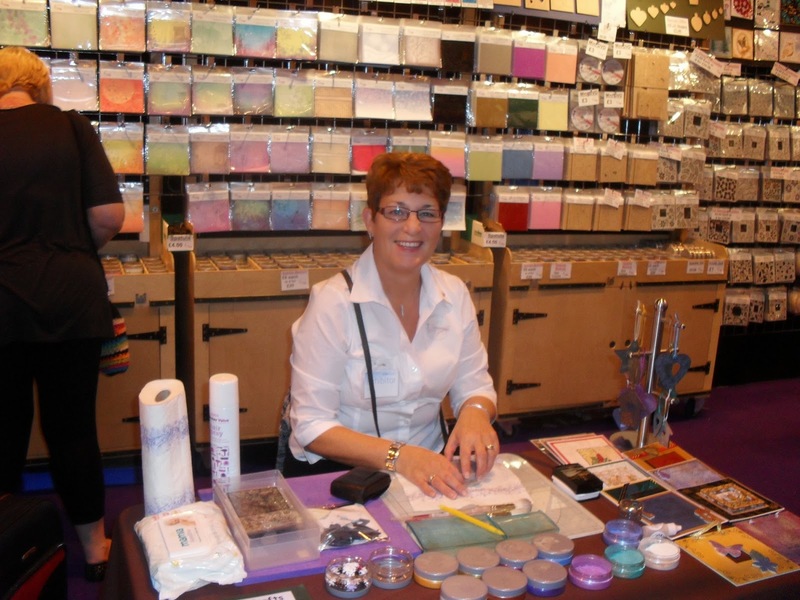 Take a square of white card and colour it using the Silkies and a paintbrush. When dry, lay the Daisy Dots Embossable onto it and spread the Sparkle Medium over it using the spatula. When dry, matt onto a piece of white card, leaving a tiny border of white showing. Glue this to the base card in a diamond style. Using white card, cut out and emboss the large butterfly. Cover the butterfly with Versamark and heat emboss using Imagination Craft's Magi-Boss Chunky embossing powder. Repeat the embossing once more (two layers). Cut out and emboss the Spellbinders border from white card and glue along the bottom of the base card. Glue the butterfly to the bottom left of the base card and add some white gems to the body of the butterfly. Cut out and emboss the butterfly circle (Spellbinders) using holographic card. Keep the circle for another project and use the tiny butterflies left over from when the circle was cut out. Glue some onto the scroll and two more onto the base card. Well we are finished. Thank you for stopping by, hope you have enjoyed your visit to our blog. Thank you to everyone who took part in our Christmas Blog Candy! We hope that you all have enjoyed your visits to the blog and our posts provide inspiration. Woohoo that is you Janltc Congratulations. Please email me with your details so I can get it in the post to you. Once again Thank You to everyone who entered. We would like to thank you all for being supportive of our blog, challenge blog and Facebook page. Your comments and support mean a lot to us! 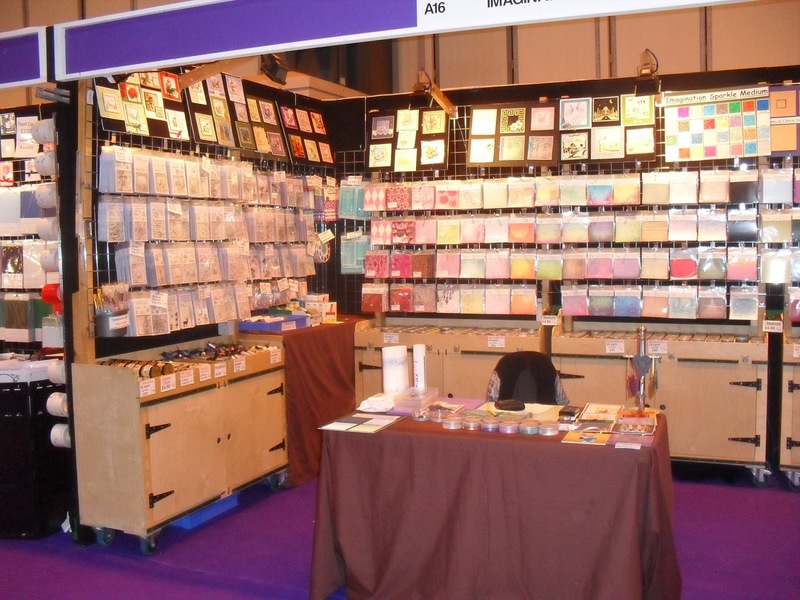 We all know that it is a busy time of year making our Christmas cards and gifts for friends and relatives. With that in mind we at Imagination Crafts have decided to offer one lucky follower some blog candy. The products we have chosen are with Spring in mind. We have the following in our blog candy. We are looking for new design team members to join our friendly team. We are looking to extend our team to 8 members. The closing date for submissions is Monday 23rd December 2013 at 12 noon. 1. You must have an active blog and Facebook account. 2. We require you to make 2 projects a month, one will be for when the challenges goes live and the second will be posted halfway through the challenge for inspiration. Our challenges are monthly. 3. Comment on entries to the challenges, we will be assigning numbers for you to comment on. 4. Once a month on the 15th (the inspiration post) a design team member will make a picture tutorial of how they have made their inspirational post. This will be done on a rota. 5. Make samples for the TV. 2. 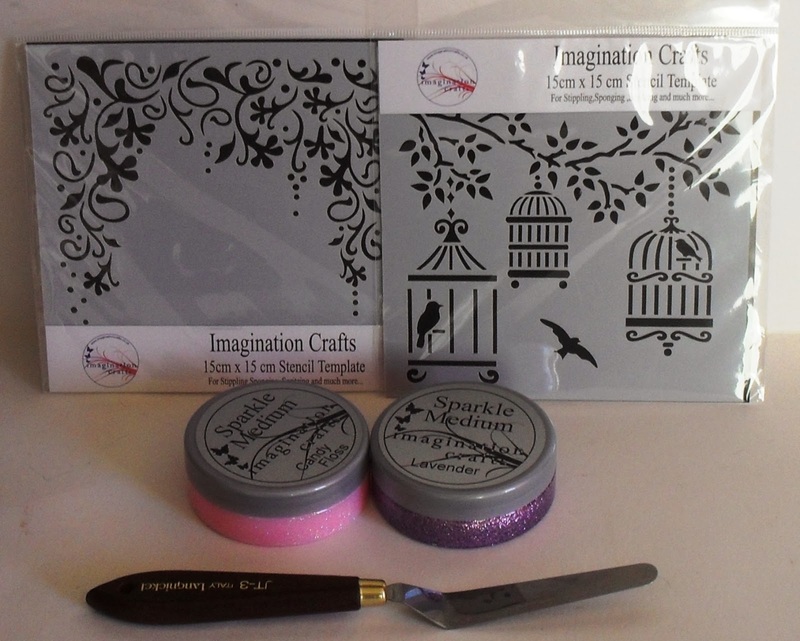 A discount off any Imagination Crafts products you buy on the website. 3. Your samples will be posted on the Imaginations Gallery. 4. Samples will be shown on Television. 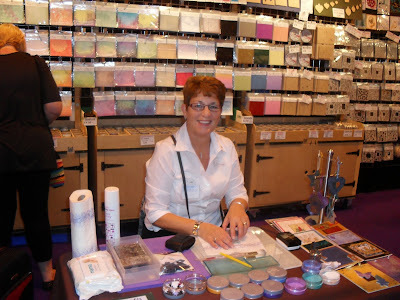 If you are, we would like you to make a sample/s using Imagination products, photograph the sample (about 2 good photographs from different angles) and email them to me (Linda) along with a small paragraph about yourself and a link to your blog. Please put as the subject header in your email Imagination Crafts DT Call. The successful candidates will be informed by email on Friday 27th December 2014. Good luck, we look forward to seeing your applications. Hope everyone is well and if not here's a big hug to make you feel better. Well today's card was made for Sue and Harvey of Imagination Crafts in August 2012 ready for the Christmas shows they attend up and down the country and for QVC. For this card I have used their Christmas Rose Decoupage Stamp Set, their Snow Dots Embossable and of course! my favourite - Metallic Silver Sparkle Medium. Ok enough waffling from me, let's begin shall we? Make a base card from red card stock. Matt a piece of white card onto the red leaving a narrow border of red around the edge. Take the gold card and lay the embossable onto it and using the spatula, spread the silver sparkle medium over it. Carefully remove the embossable and leave the dots to dry. When dry, trim the gold card to make it a little smaller, then matt it onto the white card. Using the oval die, cut out and emboss. Stamp 'Christmas Wishes' from the stamp set, onto the centre of the oval. Colour the outside of the oval with the Vintage Photo distress ink and blending tool. Glue the oval to the centre of the gold card. Using white card and the distress ink, stamp the main image of the Christmas Rose a total of four times. Cut out the roses and the holly and colour them using Promarker pens. Fix one to each corner of the gold card using sticky foam pads to give a little dimension to the card. Add the clear gem to the left-hand side of the oval. There we have it, we are finished. Hope you enjoy making this card. The beautiful silver sparkle medium does not show up very well on the photograph but in the flesh so to speak, it really sparkles. Well that's it folks until next time I blog, take care of yourselves and stay safe. Thank you for visiting, we really appreciate your visits and your lovely comments. 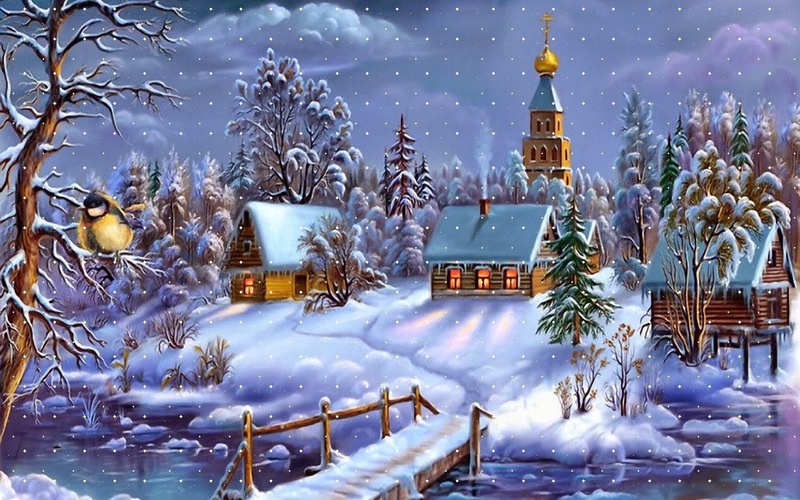 Hello Everyone Jennifer here again with another Christmas card. My goodness I just don't know where this year has gone !!! Christmas is coming, the goose is getting fat, please put a penny in the old man's hat ! a long time since I heard that lols. Well Christmas will be here before we know it! so here is a another idea for a card. This one I made for Sue and Harvey of Imagination Craft's in September 2012 and uses their Winter Boquet Decoupage Stamp Set. Make a base card from black cardstock. Matt a piece of white card onto the black leaving a border of black showing. Take a piece of vellum slightly smaller than the white card and emboss it using the 'Snowflakes, Embossable and an embossing machine. 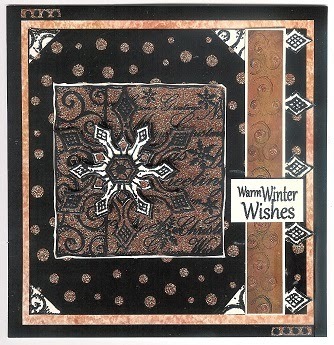 Lay the vellum onto an embossing pad and using the embossing tool, go over every snowflake. Colour the vellum with distress inks of your choice, I chose scattered straw, dried marigold and dusty concord. When dry, fix this to the white card. Die-cut and emboss the Marianne- Die pine tree branch twice, using black card and glue to the base card. Stamp the mistletoe sprig from the stamp set, onto the vellum using the black inkpad. Stamp the Winter Boquet onto white card, four times using the black inkpad. Colour with distress inks, cut out the flowers only and 3D them using silicone glue. Fix this to the centre of the base card. Well, that is it, one finished card. Take care until the next blog. See you soon. Jennifer back again, this time with a Christmas card I made for Sue and Harvey of Imagination Craft's in August 2012. 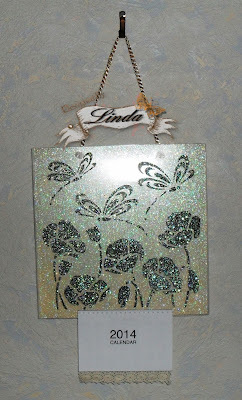 I have used two of their stencils and my favourite product, yes you guessed, Sparkle Medium. So let's get started shall we ! Make a base card from white card stock and matt a piece of purple paper onto the white card, leaving a border of white showing. 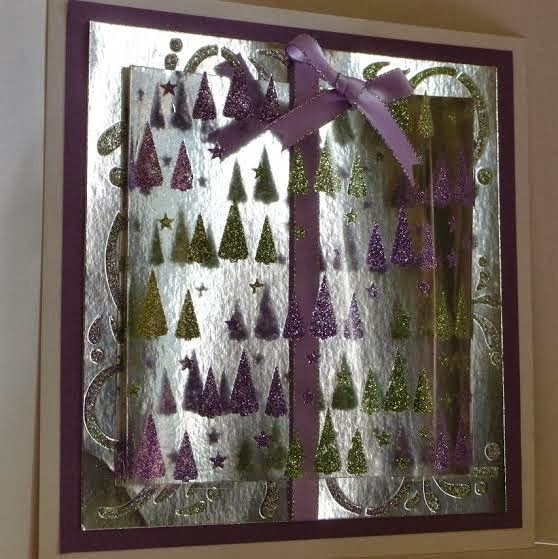 Take a piece of silver mirror card, cut smaller than the purple paper. Lay the flourishes stencil over it and spread the three colours of sparkle medium over it. Remove stencil and leave image to dry. 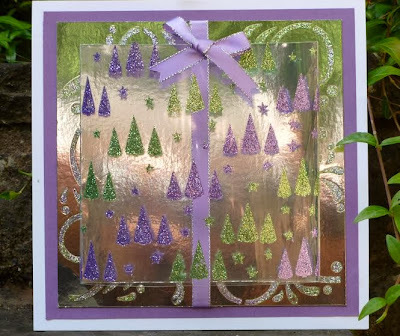 Take a piece of acetate and lay the embossable over it and spread the sparkle mediums over it, colouring some of the trees green and the others lavender and leave to dry. Wrap the acetate over a piece of mirror card and secure on the back using double sided sticky tape. Secure a piece of ribbon around the larger piece of mirror card but only at the top. Fix the mirror card with the acetate, to the larger piece of mirror card using sticky tape. Thread the ribbon down between the smaller piece of mirror card and the acetate and secure on the reverse of the card. Now, fix the whole panel to the purple paper on the base card, Add a ribbon bow to the top centre of the acetate. Well there we are card finished. I'll be back soon, until then, be happy, be safe and have a good week. Hope life has been good to you all. We have had quite a busy week so far. Hopefully I will manage to fit in some crafting time tomorrow. 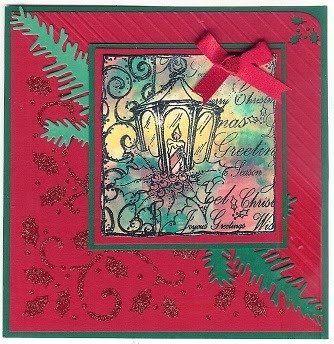 Today's card was made for Sue and Harvey of Imagination Craft's in September 2011 and uses their pretty Holly Stencil. It is a fairly quick card to make, so here we go! Take a piece of white card and colour it using the distress inks - Dried Marigold, Victorian Velvet, Scattered Straw, Peeled Paint, When dry lay the stencil on top of the now coloured card and dab the Forest Moss through the stencil using a stencil brush. When the green ink is dry, lay the stencil back onto the design and dab the Versamark Pad through the design on the stencil. Carefully remove the stencil and brush the mica powders over the design. Remove the excess powder. Trim around the edge of the design with scissors and matt onto some black card. Fix the organza ribbon across the card front, securing on the reverse. Cut out a label from black card and one from cream card using the Spellbinder's Fancy Tags Die. Thread the gingham ribbon through the slots on the black tag and fix on top of the ribbon and secure on the reverse of the card. 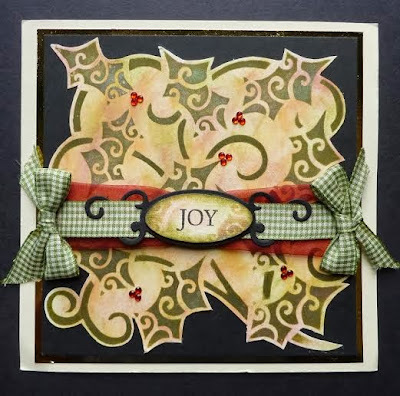 Cut out the oval only from the cream tag and stamp 'Joy' in the centre with a black ink pad and colour the cream oval using the stencil and the distress inks. Then brush with mica powders. Glue the cream oval onto the black tag. Matt this onto some gold mirror card then onto some cream card, each time leaving a border showing, slightly larger border for the cream card. Make two gingham bows and glue one on each side of the card. Glue the red rhinestones to the card front in groups of threes for the holly berries. Well that's this card finished, hope you all like it. See you again soon. Thank you for stopping by our blog, we do appreciate your visits. Hope everyone is well and managing to stay warm and cosy in this cold weather. Today I would like to share a card I made for Sue and Harvey of Imagination Craft's in July 2012 and uses their Owls Embossable and Black Stars Sparkle Medium. Make a base card from black shiny card. Matt some red card onto the black, leaving a border of the black showing. Take a piece of black card and using a paint brush and the red and yellow Silkies, paint stripes across the card, leaving a little of the black card shining through. When dry, lay the embossable on top and spread the Sparkle Medium over it using the spatula. Carefully lift off the embossable and leave to dry. When dry matt this onto the red card. Colour another piece of black shiny card as before and from that cut out two small, one medium and one large circles. Using the black ink pad stamp the cottage onto the large circle and glue to a large black circle. Stamp the word 'peace' onto the medium scalloped circle again using the black ink pad. Stamp the words 'joy' and 'love' onto the two smaller scalloped circles and glue these onto the slightly larger black circles. 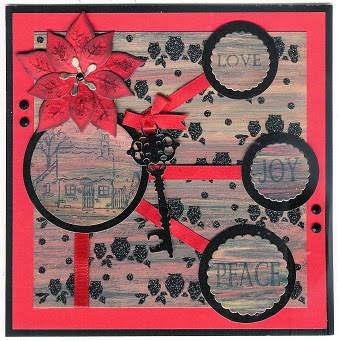 Fix all the circles to the card front adding the red ribbons leading from each word across to the cottage circle. Cut out a black key using the Marianne Design Die. Fix to a red bow and glue to the top red ribbon. 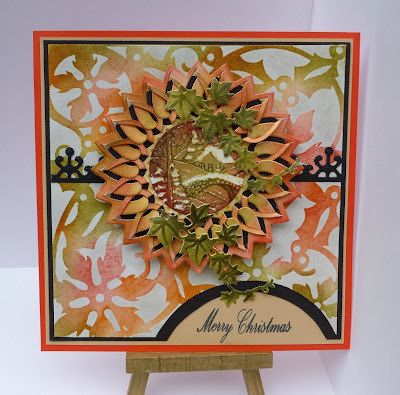 Using the Marianne Poinsettia Die, cut out and emboss the flower from red card. Rub lightly over the petals using black soot distress ink and add a little Black Stars Sparkle Medium to the petals. 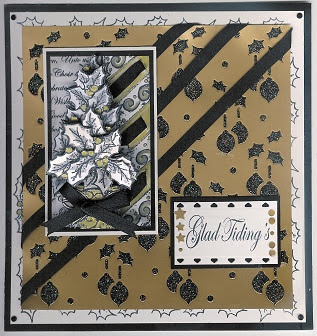 Glue the poinsettia to the top left of the card and add a black gemstone to the flower centre. Glue two more gems to the left-hand edge and another two to the right-hand edge. Well that's it friends, card finished hope you like it. Take good care of yourselves and keep snug and warm until my next blog. Thank you for visiting our blog and for all your lovely comments they mean a great deal to us all. Hi there Friends, Fellow Crafters and Visitors, Jennifer back again. Today I would like to share a card I made for Imagination Crafts in September 2012 and it uses their Snow Globe stamp, which I'm not sure is still available and their Christmas Scrolls stencil which I think is very pretty. Are we all ready? off we go then. Make a base card from red card stock. Matt a piece of beige card onto the red, leaving a small border of red showing. Cut a piece of black card slightly smaller than the beige and cut out a semi-circle from the bottom right leaving some beige card showing in the semi circle. Stamp 'Merry Christmas' in the semi-circle using a black ink pad. Fix the black card to the base card. Cut a piece of white card the same size as the stencil and lay the stencil on top. Dab the Versamark through the design on the stencil using cut n' dry foam. Remove stencil and heat emboss using clear embossing powder and a heat gun. Rub the distress inks over the design. Remove the excess ink from the embossed parts with some kitchen roll. (The embossed parts should act a a resist). Cut out a semi-circle from the bottom right of the design, slightly larger than the black semi-circle. Fix this design onto the black card using double-sided tape. Cut out and emboss a border strip from black card using the Spellbinder's Ironworks border die and a die-cutting machine. Glue this across the centre of the base card. 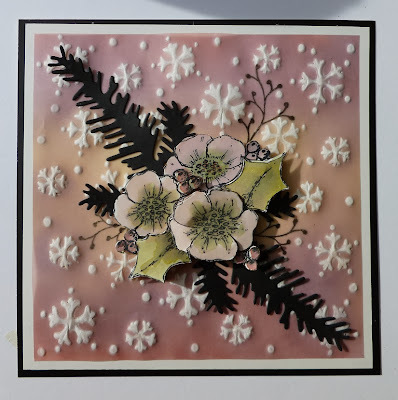 Cut out the Lace` die, colour it with the distress inks and glue this to a black circle, then onto the base card using sticky foam pads to add some dimension to the card. Stamp the Winter Scene stamp onto some white card. Colour this with the distress inks and from it, cut out a circle which will fit onto the centre of the lace` die-cut. Glue this to the centre of the die-cut. 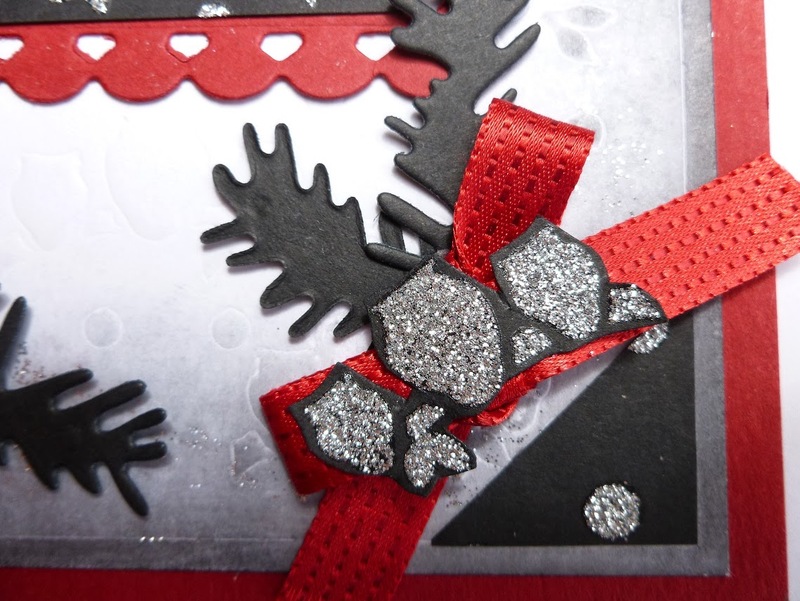 Use a fine point - some scissors or scalpel blade to scrape away the top surface of the card. i.e., where the snow would be lying, rooftops, trees, bridge top etc., Cut out and emboss the ivy leaves and colour with distress ink. fix to the lace` die cut. Well that's all for now. I'll be back soon, I hope you will be too!! Thanks for stopping by to visit, we appreciate it. Until next time, be good and happy crafting of course lols. Hope everyone is well and happy. Not long until Christmas now lols, have you all started your present shopping yet? I am cheating this year and am buying my Christmas cards !! I know, I should be making them but I just don't seem to have the time at the moment. The card I would like to share with you all today was made for Imagination Craft's in July 2011 and used their Lilac Heaven Stencil Paste. I'm not sure that the paste is still available but you could use another white paste and colour it with a lilac Inkadink. This is a quick card to make, apart from the time it takes for the stencil paste to dry. So off we go, let's get started shall we ! Take a piece of white card and colour the top half with the violet and the burnt orange mixed with water - a thin layer. When dry lay the stencil on top and spread the stencil paste through the stencil. When dry add some Glitz Gel to the snowflake centres, tree branches, snow and the snowman. Paint the band on the snowman's hat with the lilac pearly paint. Cut off each corner and fix to the dark lavender paper, leaving a narrow border showing. Matt this onto some pale lavender paper, again leaving a narrow border. Next, matt this onto a white base card. Punch out some tiny and some small white circles and glue to each corner of the card. 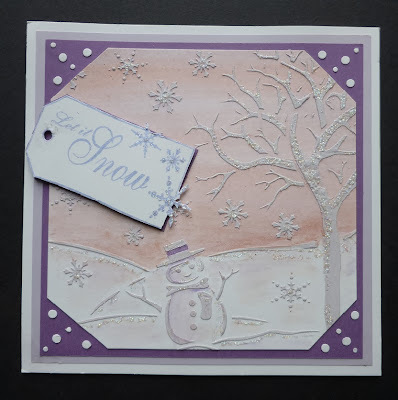 Stamp the tag and 'let it snow' stamp onto some spare white card using the Pearlescent Purple Brilliance Pad. Cut it out and add some Glitz Gel. Fix to a piece of the dark lavender paper with sticky foam pads. Trim around the tag leaving a tiny border of the lavender showing. Next glue the tag to the left-hand side of the base card on an angle. Add a bow to the tag. That's it finished. Hope you like it. Until next time keep well and stay warm in this cold weather. Thank you for visiting our blog, your comments are very much appreciated. Hello Everyone, Jennifer back again. 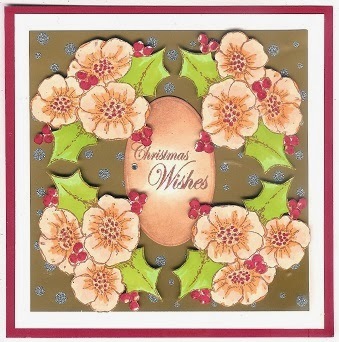 The card I'd like to share with you today is another Christmas card and was made for Imagination Craft's in July 2012. For this card I decided to stick to black, cream, gold and copper for the colours and I used some acetate and of course some sparkle medium. The stamp is from Imagination Craft's Decoupage Stamp Set and is called 'Snowflake.' Well let's get started shall we? Make a base card from the shiny black card. Cut a piece of cream card, slightly smaller than the black. Rub the Versamark pad around the edges and brush with copper and gold mica powders. Matt this onto the black card. Take a smaller piece of black shiny card and lay the embossable on the top and spread the copper sparkle medium over it and leave to dry. When dry matt this onto the cream card with the mica powder edges. Using Versamark, stamp the main image onto a piece of acetate and heat emboss with black embossing powder. Turn the acetate over and spread the sparkle medium over the back of it and leave to dry. Stamp the image again onto acetate and cover with sparkle medium as before. When dry cut out the snowflake only and fix to the main image using silicone or sticky foam pads. Stamp the image again onto cream card and heat emboss using black embossing powder. Cut out the smaller snowflake and fix to the large acetate snowflake with silicone or sticky pads. Cut out the large centre from the main snowflake - (I stamped this only, onto a spare piece of acetate which had sparkle medium on it and was over the edge of the main stamped image - waste not want not lols !) I also punched out the tiny circles used on the panel down the right - hand side using the left over acetate. Fix the centre to the smaller cream snowflake. Punch out more acetate circles to go around the smaller snowflake. Matt the snowflake onto a piece of cream card and trim around the edges leaving a tiny border of cream. Matt this onto the base card approx. half an inch in from the left hand edge. Rub a narrow strip of the black card with the Versamark pad and dust with gold and copper mica powders. Stamp the Versamark pad onto the small flourish and lift out the mica powders down the panel. Fix this strip onto some cream card and glue the small acetate circles to the flourishes. Cut out the five points of the cream snowflake and glue to the underside of the panel. Fix the panel down the right - hand side of the base card. Cut four triangular corners from the left over cream snowflake image and glue one in each corner. Stamp the greetings with Versamark onto cream card and heat emboss with black powder. Fix with sticky pads to the right - hand side of the card. Glue the left-overs after punching out the acetate circles, to the top left and bottom right of the base card. Well there we have it, we are finished, phew !! this card is not a quick card to make lols!! but I think the extra time and effort is worth while. It looks better in the flesh so to speak than it does in the photograph. I hope you will give this card a go, I'm sure you will be pleased with the end result. and until next time, happy crafting. Hi all, Jennifer here again with another card . Hope you are all fit and well. Today I would like to share another card with you that I made in September 2013 for Imagination Craft's. 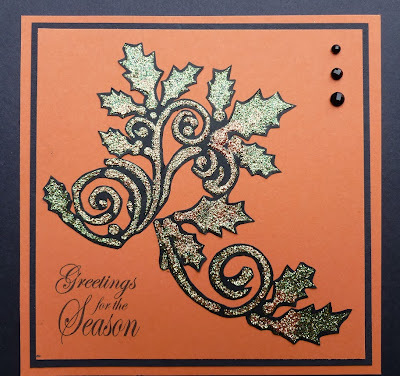 This card is made using the Holly Corner Stencil and one of my favourite Imagination Craft's products, sparkle medium. OK are you ready? let's get started then. Make a base card from the terracotta. Onto this matt a piece of black card, leaving a small border of terracotta showing. Cut out a slightly smaller piece of terracotta card and glue this onto the black card. Take some black paper and lay the holly corner stencil on top and spread the sparkle medium through the stencil. Remove the stencil and leave the image to dry. When dry fussy cut around the image, leaving a tiny border of black showing. Glue three black gemstones to the upper right corner. Stamp the greeting in the bottom left corner using a black ink pad. Well that is that finished, quite a quick card to make. Thanks for stopping by, we do appreciate your comments, so until next time, look after yourselves. Here is a Christmas card I have made using Imagination Crafts products. I just love this stencil, it is so versatile and makes a stunning card. 1. 8 x 8 white pearlescent square card. 2. First layer is green card which I have matted and layered red holographic card. I then made a bow and attached to one corner before adhering to the base of the card. 3. The topper is patterned card called Star Tree green which I have stencilled Merry Christmas Trio with Bright Red Sparkle Medium on the trees and Diamond for the sentiment. 4. To finish off I have added gems to the 4 corners and a dazzler to the centre of the bow. 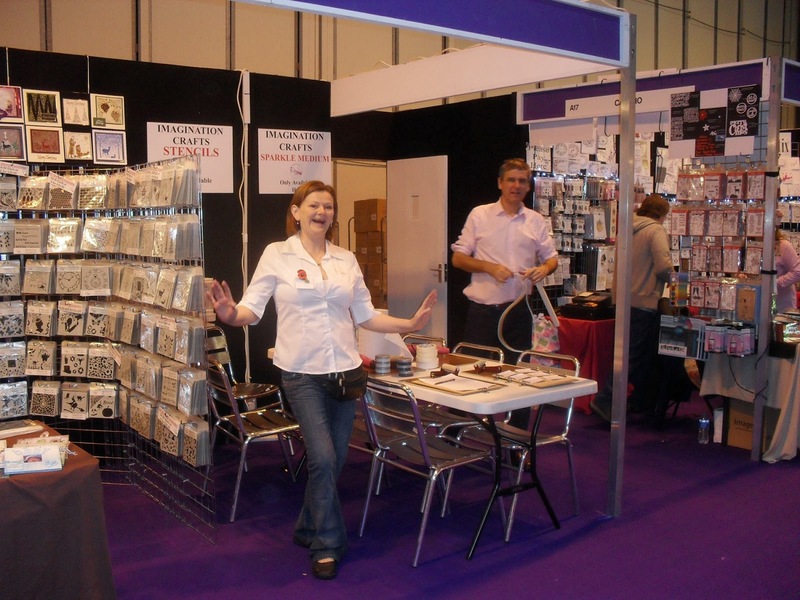 We would like to thank all of you who came to our stand at the NEC last week. We all had a fabulous time and it was lovely to see some of our old friends and make new friends too. Here are a few photographs of the Stand on the first day of the show. Me getting my demo area ready. 1. 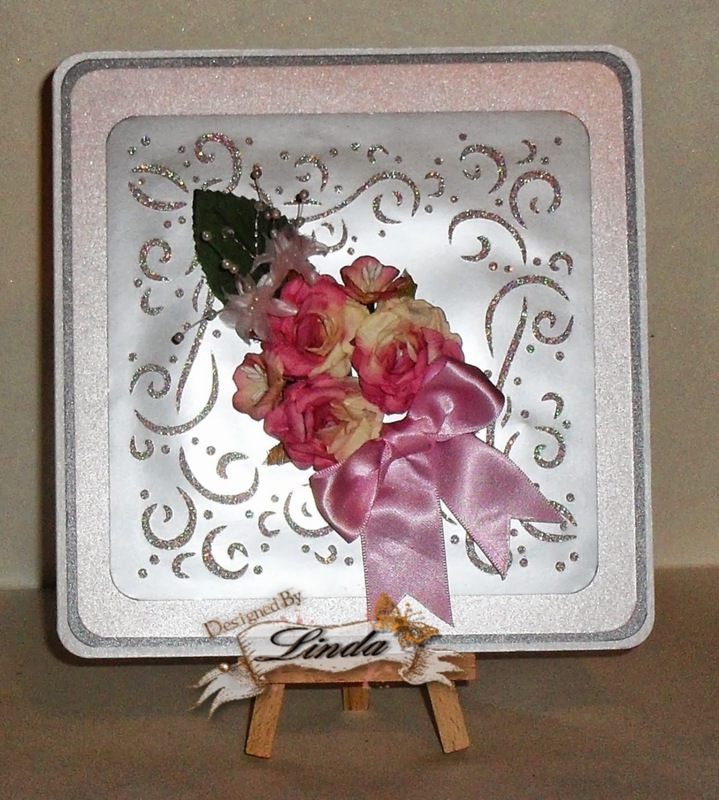 7 x 7 white pearlescent card which I have matted and layered silver and pink pearlescent card. 3. I have added a spray of flowers which includes leave, pearl stemed flowers, roses and a bow with pink ribbon. Hope you are all well and feeling happy and managing to fit in some special crafting time. My day started out quite leisurely then whoa ! it suddenly changed to a bit of a manic day lols, but I have had a somewhat more peaceful evening. The card I would like to share with you today is.....yes you guessed ....another Christmas card !! We only get to make Christmas cards once a year unlike birthday cards etc., so let's make the most of it. This card was made in August 2012 for Sue and Harvey of Imagination Crafts. So...let's get started shall we? The base card is made from red cardstock and onto this matt a smaller piece of silver mirror card. Next take a slightly smaller piece of white card and emboss using the owls stencil. Colour around the edges of the white card with black soot distress powder and a blending tool. Matt this onto the base card. Use some red card and the oblong die and cut and emboss it. Cut an oblong piece of black card to fit the centre of the red oblong. Lay the owl stencil over the black card and spread the metallic sparkle medium over it. Remove stencil and leave image to dry. When dry fix the black panel to the red oblong. Using a die cutting machine, black card and the branch die, cut out and emboss three branches. Glue two of these behind the red oblong and glue the oblong to the base card. On a small piece of black card, spread some silver sparkle medium through the dots on the snowflake embossable. When dry, cut out two triangles and put one in the top left and the other in the bottom right corners. Break off a couple of tree branches from the third branch and glue to the bottom right corner just above the black triangle. Add a red ribbon bow on top of the branches. Cut out one set of silver owls, left over from when you trimmed down the owl embossed image. Glue them on top of the ribbon. Punch out a circle from silver mirror card and screw it up ( backing will probably delaminate) we will use the top silver layer. Unfold and rub some black soot ink over it. Glue to the top of the card. Spread a little silver metallic sparkle medium around the edges of the white embossed card with your finger. Phew !!! well that is that....finished. Hope you like it. Take care until next time. Labels: Imagination Crafts, Magi-Bond Glue, Metallic Silver Sparkle Medium, Owls Embossable, Snowflake Dots Embossable.